The General’s statements regarding the North Korean presence at Homicho and Gafat were frequently contradictory, however. They alternated “between ‘we will continue to source from North Korea’ and ‘we haven’t sourced from North Korea in the past year’ as well as ‘the North Koreans have left’ and ‘some of the North Koreans may still be around.’” It is therefore possible that Pyongyang’s involvement in Gafat and other Ethiopian weapons factories continued beyond 2008. Enquiries into the affiliation of the ‘Korea Ryong Bong General Corporation’** and the nature and duration of its contract with Gafat is therefore necessary. **Further investigation into this entity suggests that the “Korea Ryong Bong General Corporation” is an alternate Romanization for the Korea Ryonbong General Corporation, which is believed to be the trading arm of the External Economic General Bureau of the Second Economic Committee. It has been sanctioned by the United Nations for its involvement in proliferation. 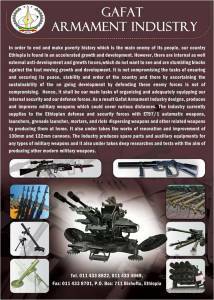 Homicho Ammunition Engineering Industry—A Fact Sheet, Metals and Engineering Corporation,, http://www.metec.gov.et/images/PDF/Homicho%20Ammunition%20Engineering%20Industry.pdf. “North Korea offers Nigeria missile deal,” Washington Times, January 28, 2004, http://www.washingtontimes.com/news/2004/jan/28/20040128-114425-6730r/?page=all. Homicho Ammunition Engineering Industry—A Fact Sheet, Metals and Engineering Corporation, http://www.metec.gov.et/images/PDF/Homicho%20Ammunition%20Engineering%20Industry.pdf. A search using Wayback Machine reveals the fact that reference to the Korean entity was removed following the UN Panel report. Gafat Armament Industry, Metals and Engineering Corporation, http://www.metec.gov.et/index.php/en/metec-industries/gafat-armament-industry. Andrea Berger, “A Legal Precipice? 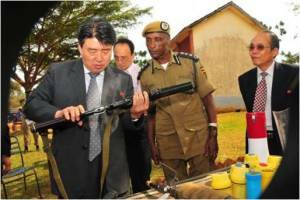 The DPRK-Uganda Security Relationship,” 38 North, November 13, 2014, https://www.38north.org/2014/11/aberger111314/.